SuperZoo is one of the largest pet industry events in the United States of the year. 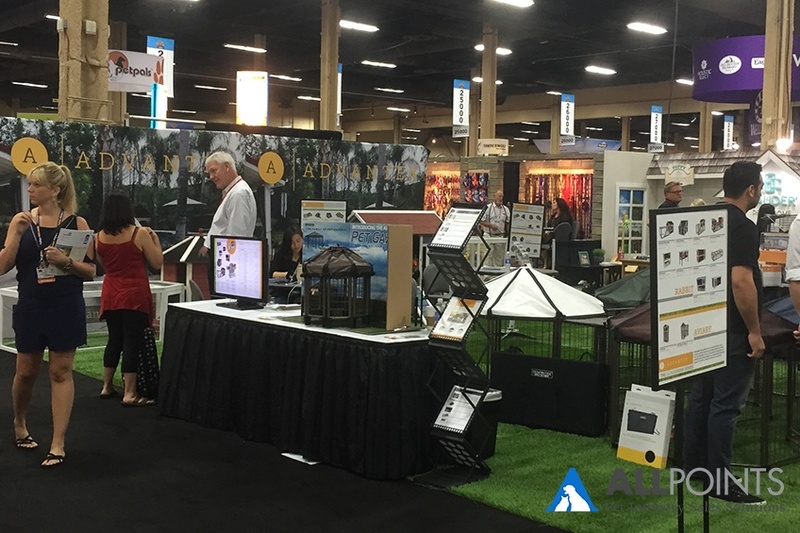 Everyone from pet product manufacturers, pet specialty retailers, and even dog groomers show up for the annual event that takes place in Las Vegas, Nevada in the middle of the summer. No matter how large or how small they or their booths are, pet businesses there to network with fellow pet professionals, show off the newest and greatest products, and become educated about the industry they know and love. And you're going to be there to join them. But, with over 1,000 exhibitors, more than 262,000 square feet of booth space (plus the 20,000 sq. ft. of new products), and more than 25,000 attendees, it's safe to say there's a lot going on at this year's show. If you're joining the 12,000 other buyers in attending the show, the only way to maximize your time and efficiency at SuperZoo is to meticulously plan your trip in advance. These are the steps you can take to do just that. Upon entering the chaos and madness that is the SuperZoo floor, it's all too easy to get distracted by the colorful displays and sales people selling you the "latest and greatest" in x category of pet products. Deciding upon your goals in advance is a great strategy to stay focused and ensure everything you do at the show maximizes efficiency and accomplishes these objectives. What do I want to get out of this show? How many vendors do I want to meet with, and which ones are top-priority? Who should I schedule meetings with and who should I just plan to stop by the booth at some point? What is my budget (more about that later)? What seminars should I attend? What holes do I need to fill in my current pet product offerings? Once you've come up with 2-4 concrete goals, see if you can draw up a strategy to meet them. For example, if you want to walk away from the show with a new marketing campaign idea and 10 new potential product vendors, plan to attend the social media marketing seminar. Then, create a list of 20-30 vendors you're the most interested in. Of course, creating this list will require a bit of homework before you get on the plane to head to the show. With so many exhibitors attending the show, you're guaranteed to not see all of them. Well, you could, but according to John Gibbons, the self-proclaimed Pet Business Professor, you'd only have 68 seconds at each booth, and that's only if you skip doing anything else (bathroom breaks & eating included) and walk 2.5 miles per hour in between. With that said, doing some research before the show is the best way to ensure you're being as efficient with your time as possible. To create a list of potential manufacturers to meet with, visit SuperZoo's website to discover which vendors are going to this year's event. Using the "Advanced Search" tab, you can narrow down the process by searching through the category(s) of products that are most relevant to you. SuperZoo even provides extra details per exhibitor including videos, products, show specials, and social media accounts to help you narrow down your search even further. Don't forget to include the new product showcase, which is a must-visit for any pet trade show - especially SuperZoo. This is the best place to find out what is up and coming in pet products and identify which may fit in with next year's product selection. Once you have your list of potential exhibitors, it's time to plan out your visit based on their booth's location. This is when things could potentially get tricky. Fortunately, Gibbons has created a tool to make this step a little simpler. Planning your exhibitor visits used to be pretty tough. Once you got your list of potential vendors, you had to physically find every booth on SuperZoo's floor plan and create a route that maximized efficiency between each exhibitor. Fortunately, John Gibbons made this process easier with his Super Search Visit Planner for SuperZoo 2017. According to Gibbons, the Super Search can either give you a list that you can easily access on your phone or tablet, or go in-depth and offer you simultaneous search for multiple specific product categories and then narrow down the results. While it's not 100% accurate, it's very close to it, and can be a great resource when planning out your visit to SuperZoo. Download your Super Search here. Plus, download the quick start guide and instructions for clarification on how to use the tool. Now that you've got your vendors listed and your routes planned out, it's time to start scheduling the meetings and organizing your time at the next level. We recommend reaching out to the vendors you'd like to meet with and request times that will work best for you and your schedule. Of course, you don't need to schedule a meeting at every single booth, but pick the top few that are must-sees while your at the show. This will ensure you've got the right people at the right time at the booths that are the most important to you and your business. SuperZoo has recently launched an app that is meant to help facilitate the mundane process of scheduling meetings with manufacturers you're interested in. Last year, SuperZoo released an app designed to help pet trade show exhibitors and attendees navigate the show easier and more effectively. The app can be used for a variety of trade show-related tasks such as viewing and tagging your favorite exhibitors, browsing the latest products, and planning a walking map. The app is still around - and after using it at last year's show, we see the benefit in downloading it and utilizing it for certain tasks to make your visit as efficient as possible. If you're not sure exactly how to use the app, we created an in-depth guide to using the new SuperZoo app at the upcoming show. Click here to learn how to use it to it's full potential. The success you see at this pet trade show is largely up to you and how you spend your time. Keep in mind that show goals will vary from person-to-person and business-to-business, so don't fall into the comparison trap with those who saw more than you or partied harder than you (I mean, it is Las Vegas). Measuring your success will depend on the goals you set before the show and how well you accomplished them. In the end, if you are able to succeed in your objectives, then you can come home from the show assuring yourself that it was time well spent and a job well done.